Sharp, tough heroine Shelley Krieg drives the plot of this fast-paced mystery. Martin Hill’s nuanced third mystery novel features Washington Metro Police detective Shelley Krieg. In Never Kill a Friend, an unusually gruesome murder forces her to operate outside the boundaries of police protocol. An African-American “giantess,” Shelley measures over six feet tall. Her physical presence, sharp mind, and well-honed detective skills command the respect of her predominately white male colleagues. After charging a confused teenager with the bizarre murder of his half-brother, her interest in the case devolves into a confusing struggle to discover the truth. That same night, she wakes from a deep, groggy sleep to find that intruders have left in her bedroom a graphic reminder of the first murder. Trusting only her erstwhile friend and forensics expert, Mira, she begins their rogue investigation. The intruders to Shelley’s house had drugged her, so she wakes up with no memory of the incident. Her repeated attempts to recall what happened increase the suspense as she continues to encounter obstacles in her investigation. Martin Hill writes with an awareness that brings emotional depth to the interactions of his characters in this well-told mystery. While maintaining the fast pace of a detective caper, thoughtful passages describe Shelley’s childhood, her loyalty to her heritage, and her struggles to adapt as a black female to a tough urban police force. The surprising conclusion leaves unresolved issues that might promise a sequel. 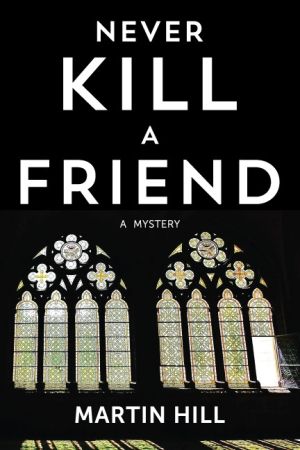 Those who enjoy suspenseful mysteries will be well entertained by Never Kill a Friend.